Seattle Opera Blog: Seattle Opera's Caption-Writing Contest! Seattle Opera is launching a photo caption-writing contest and we want to hear what you’ve got! The below photo is from our current production of The Marriage of Figaro, but don’t let that limit your imagination—we know the story of Figaro, tell us what other crazy things could be going on in this picture! We'll pick a winner by the end of the week, so be sure to check back to see if your caption is selected as our favorite! Have a great caption? Post it in the comments section. Madame 1 (left): EEEK!! We have to deflate the mouse! Madame 2 (right): No, this is Figaro! It was the Day of Madness all right! Susanna sees a horde of cockroaches in procession across the room, and throws a wobbly. Rosina tells her she will ruin her make-up for the wedding photo-shoot. "I don't care two Figaros" replies Susanna. Marcellina: I *told* them to eliminate the kazoo section from the orchestration! No you don't! We agreed that *I* get to spank the Count! I don't care who's Poodle it is - it isn't getting under my skirt. No, even though the orchestra just started playing "Take Me Out to the Ballgame", you can't hit the conductor with his own baton! Gracious M'lady! What has John Edwards been up to now? Lady 1: Costume malfuncion! I can't move my right arm or breathe properly. Lady 2: Hang on I will fix the problem if you stop waving your left arm. Woman 1: Cherubino! You horrible lad, this will teach you to try to look under my dress! Woman 2: Please don't! Sigmond Freud says that he wants to be spanked! Oh dear! The knickers are all in a bunch again! I warned you about eating all those pastries, Countess... Now -lift those arms and pray god grants me the strength required to cinch this corset up! OH MY! YOU SEEM TO BE "BUSTING OUT" AGAIN, LET ME CINCH YOU BACK TOGETHER WHILE I DISTRACT EVERYONE WITH A LITTLE TUNE. Lady in Green: "Ew, what in the world is that?" Lady in Pink: "I have no idea, and I'm not asking." 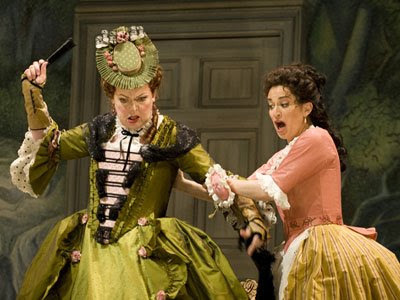 GEEZ my dear Marcellina... you must cut back on the tea cakes if we're ever to get this corsett tight enough on you! I'll beat some sense into that costume designer! I told him I couldn't sing in a hat that's about to fall over my face! 1: "EWWWW! Is that a roach or a rat or an elf???? Whatever, it's gross and I have to kill it!" 2: "Don't hit it!!! Haven't you ever seen 'Honey I Shrunk The Kids'??? It has that dude from Ghostbusters in it!" 1. "Loser I'm not THAT old!!!! I only remember back to Wayne's World and no further!" 2. "Fine, go ahead kill it but if the next generation runs out of mad scientist genetics it will be YOUR FAULT." 1. "I can live with that." Oh Senora, it is a miracle! We have found your darling little Fifi! Wench - hold still while I tighten these laces, then you can wave that magic fan and get us both out of here. Woman in green: "Mammy, it's just got to be 17 inches"
Woman in pink: "You done gone had a baby Miss Scarlet, you ain't never gone be 17 inches again"
The idiot who designed my hat must think I'm a pinhead! "I don't care if you are his long-lost mother; I won't let you make up for a lifetime of spanking on our wedding day." The women were shocked to see the floor stained with the image of Mickey Rooney. Ein Faecher verhiess mir der Vater! "Stop yelling at me to breathe in; I'm telling you this corset is the wrong way round!" Woman 1: "Lithium, sodium, potassium, rubidium....what am I forgetting??? Help! I'll never pass this chemistry test!!!" Woman 2: "Caesium and francium, dear. Caesium and francium. Green: Behold, what opens below us! A vortex, a rip in time and space! But wait, it seems so familiar somehow... Soft! Could this be the same space-time vortex that bought us drinks at that bar in Skokie back in '79? Pink: AAAAAAAHHHH!!!!! I can't stand any more of your CONSTANT REMINISCING!!! I PUSH YOU IN NOW!!! Pink Lady - No! Don't do it! Green Lady - He's been a VERY bad boy! Dress rehearsal at Seattle Opera was derailed Thursday afternoon by an innocent prank, when the orchestra mischievously played "It's Not Easy Being Green" at Marcellina's entrance. The ensuing violence left several wounded on the stage and in the pit. "The tribbles are going crazy!" "Quick, take off that xylophone!" Cherubino, you need to MAN UP! "Are you nutty, or do you think he will be?!" Susanna: This stupid wind up thing worked a lot better in "Hoffman." Look how fast it's running! It must be de fleetest mouse! Seattle Opera: It's ain't over until the Fat Lady swings. Though many long time patrons questioned the wisdom of having Lorenzo Romar guest-conduct the performance, no one could question the cast’s tenacity to go after loose balls a fundamentally box out. Finally, a definitive answer to the age old question: If you give a woman the TV remote in the 17th century, would she Bogart it just as much as a modern day woman? Arguably the cast could have reacted more subtly to the realization that the orchestra conductor’s fly was down. "I told the producer that if I wasn't cast in the next Harry Potter, there'd be hell to pay.....!!" I said, "No more wire hangers...EVER!" Damn that Adam Lambert! He has better brows than I do!!! Noooooo-not the new hi-def plasma screen TV! Lady in Pink: "Ma'am, stay away from that pig! You could catch the Swine Flu!" Lady in Green: "Nonsense! I'll use my comb, feather toilet plunger, and my hoop skirt of 32 rosettes to save us. Die, cochon, die!" These are from my mother, Ruth Petersky. I claim no authorship. 1) Quick, call Costume Rental! Something just slithered out from under my petticoats! 2) Fifi, get back under my hoopskirt right now! You know this Boutique Hotel doesn't allow dogs! (mistress): What?!! I was just fanning him when he fell---. Many realized that having local restaurateur Dixie’s BBQ” as a corporate sponsor was a curious choice, but few could have predicted the hilarity that would ensue when they convinced the performers to “meet the man” on stage during the middle of Act II.